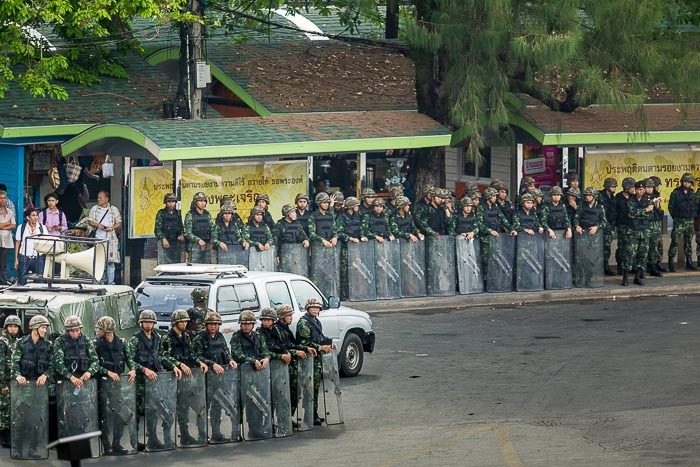 Thai soldiers stand shoulder to shoulder around Victory Monument. Victory Monument, a huge traffic circle and intersection in Bangkok, has been ground zero for the protests against the coup. On Saturday, two days after the coup, several hundred protestors ended up at Victory Monument for a couple of hours of chanting, marching and venting against the generals who staged the coup. The next day protestors gathered in Ratchaprasong Intersection and repeatedly confronted soldiers. Just as the Ratchaprasong protest looked like it was going to end in violence, with protestors lining up to charge soldiers and soldiers forming lines to battle pro-democracy protestors, the crowd abandoned whatever plans it had and went to Victory Monument. Monday and Tuesday protests started at Victory Monument. Both days protestors verbally confronted authorities but there was no violence and authorities made no effort (besides verbal pleas to go home) to shut down the protest. 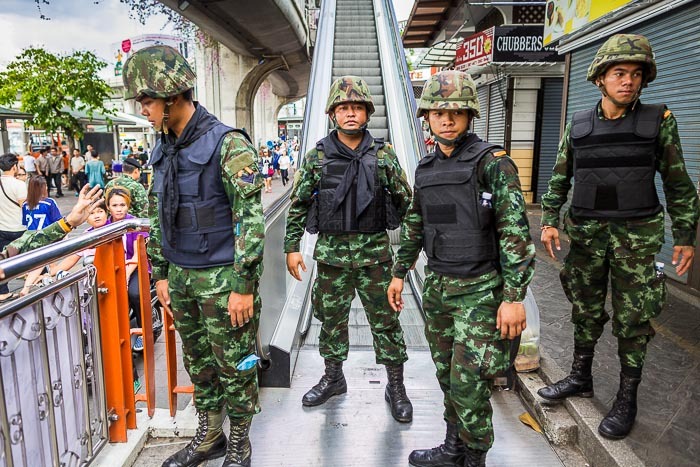 Soldiers block access to Victory Monument Skywalk. The protests start about 4PM, just as people are getting out of work. At about 3PM well over 1,000 soldiers and police descended on Victory Monument and sealed it off. They started out by shutting down all of the small food and clothing stalls in the market around the Monument, then they asked people to leave the area and then blocked the streets leading into the Monument. By 3:45PM the area was completely locked down. Some people still lingered but there was an overwhelming government presence and no one had the temerity to challenge the soldiers. 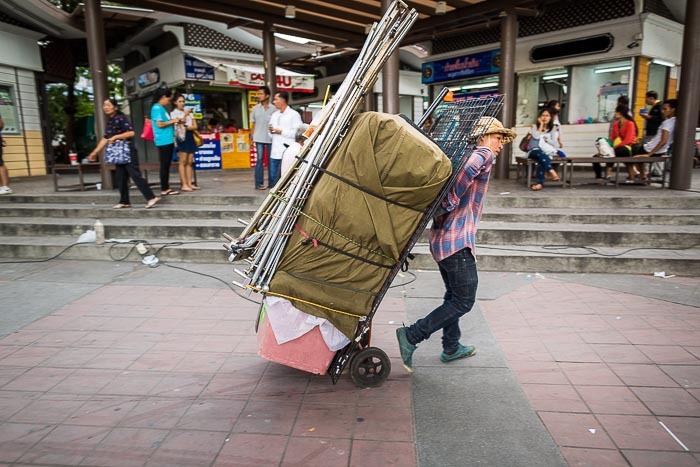 A vendor pulls her shop away from Victory Monument after soldiers asked her to leave. If the government plan was to prevent protestors from disrupting traffic it was successful. If the government plan to was to keep traffic moving in a normal fashion it was not. VM is one of the busiest intersections in Bangkok. Disrupting traffic here has a ripple effect across central Bangkok. The traffic disruption Thursday was massive. No traffic got through the intersection for more than two hours. No private vehicles, no taxis, no busses. No commuters. At the same time, protestors were not inconvenienced at all. They didn't get to protest, but they were there and managed to make their point without raising a voice. I saw a lot of people in the crowd that I've been photographing since the coup. Since they didn't protest, soldiers didn't arrest them. 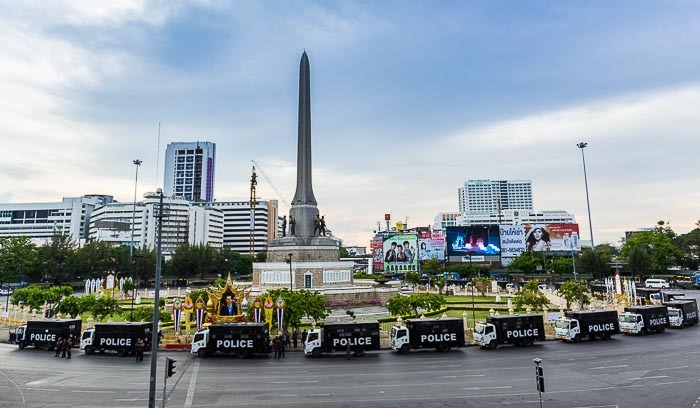 Police vehicles surround Victory Monument. Normally this is a slow moving river of cars, in near constant gridlock. I think the question is how long can the junta continue to preemptively lock down Victory Monument. They could do it every day, but that would paralyze Bangkok rush hour traffic. Now that they've done it twice (they locked it down again Friday evening) the protestors will be waiting for the first day it's not locked down. And then they'll be back. It's a cat and mouse game I'm not sure the junta can win. For the media in Bangkok it means we have to go to VM every afternoon and wait. Nothing happened today. But we have to be there for the first day something does happen after the lockdowns. There are more photos of the lockdown and Thursday's protest (there was a small protest at Chong Nonsi BTS station) in my archive and available from ZUMA Press.